Striking a balance between environmental stewardship and economic stimulation. These initiatives aim to use development of a mine as a stimulant for development of local businesses that become independent, to the extent that they continue to thrive after the mine has come to the end of its life. The aim of achieving sustainable economic activity is an exciting challenge that is built on connecting the deep and fundamental knowledge of the region by the local people with economic stimulus brought about initially by demand from the mine. 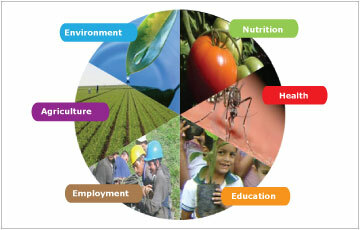 Basic initiatives may include agriculture, small business development and micro-finance. Education in the outlying areas in which our deposits are located would benefit from support. The possibility of augmenting the teaching provided by local professionals with on-line content provides an exciting opportunity to broaden the exposure of scholars as well as teachers. Water quality is a sensitive issue and it is absolutely essential that water discharged into the environment from mines and processing plants is free of contaminants. The associated monitoring provides a means of heightening awareness of water quality and empowering local communities to monitor the quality of water that they discharge to the environment. U3O8 Corp’s commitment to responsible exploration means being a good neighbour and respecting the environment in which we are exploring. To that end, we engage in responsible environmental practices and health and safety programs for our employees and the community. And we work with the community to identify practical ways in which quality of life can be improved through better nutrition and water quality, health, education, employment and new areas of agri-businesses. Nutrition – Development of a central vegetable garden in which the community participates to determine which vegetables grow best in the specific project area. Individuals are provided with assistance if they wish to plant a vegetable garden at home, and have access to education about nutrition. Assistance is provided in the development of fish ponds for tilapia, which provide an excellent source of protein. Earthworms are raised to compost organic matter and provide food for fish. Health – Support the well-being of local citizens (eg. fitness classes, sporting activities, provide transport for the State nurse to reach outlying communities, implementing initiatives to control local health issues such as malaria and leishmaniasis). Education – Support learning and information sharing (eg. a pre-school nursery, Kindergarten, adult literacy classes, University Sponsorship Program, workshops, town briefings and project site visits). Employment – The majority of our exploration teams are employed from the country in which the projects are located including nearby communities. We also make a concerted effort to source supplies and services locally. Agriculture – Support development of agri-businesses by helping to evaluate potential new crops and growing techniques that are likely to facilitate the development of sustainable businesses in the areas in which the projects are located (eg. production of avocados, cacao for chocolate, teas, bamboo for furniture, construction and flooring, anti-oxidant berries, dairy products). Read more about how U308 is involved with their communities. We have implemented responsible environmental practices to minimize our footprint during exploration (eg. man-portable rigs, control of soil erosion, aerial transport system, restoration of exploration areas, tree nursery). We are also working with the community in stewardship of the environment (eg. improving potable water quality, composting, education initiatives). Precautionary measures are practiced for a safe and healthy workplace (eg. successful malaria control, worker radiation monitoring devices, protective gear, contamination control and monitoring procedures). Safety is priority one at U3O8, read on to learn more.